Niche line Bond no. 9 will launch Bond No. 9 Dubai III. Black Sapphire (shown), Jade and Garnet join the previously released Dubai trios (Citrine, Amber and Amethyst and Ruby, Indigo and Emerald). Dubai Black Sapphire. Engrossing as a forest, with lingering basenotes sprinkled throughout, Black Sapphire holds an obvious masculine appeal, yet has a mellowness that will compliment an assertively feminine woman. Its topnotes—citrusy neroli blended with spicy-mellow saffron and beeswax, hinting of honey—are followed by Black Sapphire’s only floral, resplendent Turkish rose, surrounded by warm, balsamic gurjun, resinous cedarwood, and a hit of pungent pepper. The scent dries down with incense-rich oud and Siam benzoin, soothing sandalwood, cinnamon-like tolu balm, and earthy vetiver. Dubai Jade. Vibrant and high-energy, Dubai Jade blends sparkling florals with languid incense. Starting of with nuanced wood violet leaves, tart raspberry, and warming cumin, it segues into a heart of classic florals—rose, lily, and jasmine—played out against crisp, clean cedarwood. A mélange of syrupy basenotes—resinous amber and its botanic counterpart. ambrette, along with sensual musk, incense-rich oud, and leather-like birch tar—add a powerful resonance. Dubai Garnet. Here, a romantic floral bouquet gets some unexpected partner notes. It starts with a brisk wakeup call: citrusy bergamot, light but musky blackberry, licorice-like cardamom, invigorating seaweed, and pink pepper that smells distinctly like a rose. Rose in fact is a major mid-note, accompanying those other florals, magnolia, jasmine, and lavender, along with succulent plum and spicy cumin. Classic woody and resinous basenotes—musk, amber, myrrh and vetiver—give staying power, while oakmoss adds a creamy-soft hint of chypre. Bond No. 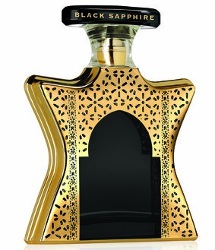 9 Dubai Black Sapphire, Jade and Garnet will be $550 each for 100 ml Eau de Parfum. A 3-tier black velvet box with all 9 Dubai fragrances will be $4,500.